But what makes that form of generosity so rare? Why has listening — which seems so simple and necessary — become such a valuable commodity? The answer is that as natural as listening is, it’s actually quite difficult. It requires tremendous discipline to embrace. It asks that the listener set aside all of the thoughts and tasks except the one at hand, and place all of their focus — that ancient form of generosity — on another person. It also requires the other person to accept that attention, and meet it with vulnerability. When both parties enter that relationship, a special experience takes place. It’s the flow that great teams create, the connection that strong partners have, the insight that talented artists need, and the rapport that top managers foster. It’s the mode I try to enter on every episode of the show, because I know that the best conversations come out of it. Which is why I talk so often about the importance of listening. What I haven’t explored as much is how to listen — what listening actually means in practice and what it requires — and which experiences, skills, and relationships become possible if you master this superpower. That’s what we’ll be exploring in this article. Listening seems like a self-evident skill, like breathing or talking. But what most people consider listening is actually hearing. Hearing is about content — what someone says, maybe how someone says it, and what it literally means (or, more often, what it literally means for us). Hearing is an important component of listening, and it’s one stage in the deeper relationship we’ll be working on in this piece. Beyond hearing is listening, and listening is about discovering a broader range of meaning — the deeper significance of what someone says, what it subtextually means, what emotions, thoughts, and beliefs are hidden behind the words, and how those ideas connect to other, bigger, ideas. Listening is also about intention. It means being available to receive someone’s words, choosing to take them seriously, and wanting to become closer to them. Which means that true listening is a choice, as well as a skill set and a habit. When you listen, rather than hear, you access an entire world of information that is not immediately apparent. You also connect that information with other information, and use it to expand the meaning of what the other person is saying. If you’ve ever been in the presence of someone who truly listened to you, you know how fulfilling this experience can be. Being listened to makes us feel seen, recognized, understood. It can make us feel more in tune with our own thoughts and feelings, more inspired to explore them. It can even make us feel more interesting — as if we were the best version of ourselves all along, but just needed someone to notice. Unpack any successful relationship, organization or project, and you’ll find true listening at the heart of it. That rare and pure form of generosity is what allows leaders, partners, and creators to understand themselves and the people around them to do their best possible work. The research bears this out. One study of managers and employees, for example, found that listening explained 40 percent of the variance in leadership. Tons of anecdotal evidence confirms that true listening is a central tool in the management toolkit. Strangely, though, researchers have also found that the average person listens at only about 25% efficiency, a statistic that is almost certainly dropping. This is a strange contradiction, given how powerful good listening really is. That experience often seems mysterious, but it’s actually a function of a handful of learnable skills that we can master and offer to other people. And it all starts with how you listen. Hearing is done with the ears. Listening is done with the body. It might sound strange, but when we truly listen, our entire body is put to work with the aim of understanding another person. The key to listening with your whole body is becoming more attuned to every sense as you sit with someone else. Which words are you hearing? Why is the person using those words? Which words are you not hearing? Why is the person avoiding those words? What is the tone of those words? What is the intention behind the words? What is the rhythm and speed of the words? What is the energy level of the words? What are the silences between the words telling you? Hearing seems like a monolithic sense, but it becomes incredibly complex once you realize just how much there is to listen to. We have to choose to listen to those layers by bringing more conscious attention to every interaction. In other words, we have to get curious. We have to stop settling for the immediate meaning of someone’s words, and dig for the deeper meaning those words are conveying. The next prominent sense in listening is sight. We usually think about language as auditory, but processing language is actually a dance between our eyes and our ears as we piece together words and body language to understand someone’s meaning. Which facial expressions are they making? Which gestures and cues are they using? What is their posture saying? What is their eye contact communicating? Do their words and body language align? What activity are they engaging in addition to speaking? What do their paralinguistic cues say about the larger environment? In many cases, what you see is more meaningful than what you hear. That’s because human beings can lie pretty easily with their words, but find it much harder to lie with their bodies. When you watch a tense scene in a movie, tune in to congressional testimony or suss out a taxi driver at three in the morning, you’re almost always listening with your eyes. If the words they use actually matter, it’s usually in relation to how their body is reflecting or contradicting that language. Hearing and sight give us access to most of the information people offer to us, consciously and unconsciously. But the other senses can come into play, too. As bizarre as it sounds, even smell is a form of listening — a very primitive form that comes into play in high-pressure scenarios. Talk to any professional interrogator, for example, and they’ll tell you that fear has a very specific smell (apparently spinach, among other things, according to some of the expert interrogators I’ve interviewed). When an FBI agent questions a suspect, they are literally listening through their nose, as well as their eyes and ears. Of course, that valuable information is being said — it’s just being communicated in verbal and nonverbal ways. That’s why listening with your whole body is so important. It’s the only way to fully grasp the full range of subtext that people are communicating in subtle ways. When we listen with our whole bodies, we engage in a heightened attention that transcends our highly-evolved brains. We enter a relationship with the other person through all of our faculties — our whole consciousness — allowing us to understand and empathize with someone on a cellular level. That’s the kind of listening I try to do on the show. When I feel my abdomen clench in response to someone’s story, or I notice my eyes grazing across someone’s mouth when they reach for a memory, I know I’m having a connection with the other person that is deeper than language. And that gives me data I can use to ask the right follow-up question, dig deeper into a story, and invite the other person to share more of themselves. Of course, this kind of true listening requires a certain discipline. We have to want to dig deeper. Which brings us to the next principle. We all know how important it is to focus in today’s world. We’ve learned that the cult of “productivity” is spreading our attention too thin. We know that our phones are isolating us rather than connecting us. And yet we still indulge a number of distractions that prevent us from truly listening. Ironically, if we cut out all of those distractions in the moment of listening, we’d actually get more done. (More on that later.) Splitting attention doesn’t allow us to gather more information; it fractures our listening across multiple stimuli, making our attention shallower with each one. We might feel more productive (or just want to believe we do), but we’re almost always creating more work to access the same amount of information. Three common sources of distraction get in the way of true listening. The most common technological distractions include phones, tablets, television, computers, browsers, apps, music, podcasts (even mine, as much as I hate to admit it! ), and the Internet in general. Answering email, checking the news, responding to texts and glancing at screens are so common now that we no longer see them as problematic. In fact, they look a lot like “doing your job” and “staying connected.” In reality, they’re some of the most absorbing distractions, and all the more distracting when they’re literally in our pockets. We have to set them aside to have a true listening relationship with another person. Distraction often comes in the form of other people. These people could be literal bodies in the same space or thoughts about other people in your head. We have to choose to focus on the person (or people) right in front of us in order to truly listen. If we indulge our mind’s desire to focus on multiple people — by starting side conversations, eyeing strangers as they pass or eavesdropping on the table next to us — then we fracture our attention. The best listening requires focus and intimacy, which means being disciplined about whom we place our attention on at any given moment. Oftentimes, it’s our own mental activity that gets in the way of true listening. When our minds wander, when we think about what we have to do later, or when we find ourselves judging what someone is saying while they’re saying it, we’ve slipped into the most toxic distraction of all: ourselves. But thought is a difficult distraction to eliminate. For one thing, we need thought in order to listen, so it can be hard to know which thoughts are helping and which are getting in the way. Even the desire to be a good listener — “Am I listening correctly? Am I showing this person that I care? Am I tracking what this person is saying? Do I have a good response ready?” — can itself become a barrier to listening. And our thoughts often hook into the other two distractions. When we get lost in thought, we’re often thinking about other people, or about engaging with those people through technology (“I have to text my mom,” “I wonder what he’s up to,” “I should really post something,” etc.). When all three distractions connect, we can be in multiple places indulging dozens of different thoughts — everywhere but right here, listening to the person in front of us. So this is is tricky. It takes time and awareness to recognize which thoughts are in service of listening and which are undermining it. Resisting the pull of those distractions and focusing our attention entirely on the other person is really a form of mindfulness, and mindfulness takes time to cultivate. The best way is to practice, by remaining self-aware, placing as much of your focus on the other person as possible, and noticing which thoughts increase your attention and which thoughts diminish it. When you do, you literally make room for true listening to take place. As Cal Newport taught us in his brilliant interview, your greatest competitive advantage in this world is decluttering your mind and resetting that focus. That simple discipline alone will set you apart in a world intent on distracting you at every turn. Every word is informed by an emotion, and carries the residue of that emotion. The words a person chooses, how they deliver those words, and what the words are pointing to — or trying not to point to — offer a window into the emotional life of the person speaking. In many cases, that emotional life is more meaningful than the literal denotation of the words. So when you listen, listen for emotions, not just information. How does this person feel about what they’re saying? What are their words, vocal tonality and body language saying about their feelings? What is this person excited about, afraid of, or interested in? What is this person trying not to feel? How do I feel when I listen to this person? What do they want me to feel? In some cases, emotions are easy to notice. If someone is beaming with pride, crying about a setback or shifting uncomfortably in their seat, they are communicating their feelings openly. More commonly, emotions are buried beneath layers of language, self-control, and secondary feelings. For example, a salesman can come across as brash and well-rehearsed, when in fact he’s afraid that he won’t close the sale. A passionate grad student can present as capable and dedicated, but can actually be wrestling with the anxiety that she isn’t good enough to finish her thesis on time. Human beings are complex. We often have to listen carefully for these well-hidden emotions, using all of the skills we’re discussing in this piece. When we listen for emotions, we gather more data that can equip us to make better decisions. Those decisions, of course, depend on our role in the relationship. For example, if you were that salesman’s prospective customer, identifying his fear could put you in a better negotiating position. But if you were that salesman’s boss, noticing his fear would help you identify the mindsets he needs to work on to improve his sales figures. Either way, listening correctly gives you a major advantage. But listening to emotions isn’t just about taking an inventory of other people’s feelings. It’s about empathizing with those feelings and finding yourself in them, so you can deepen the connection you have to the people around you — which brings us to the next principle. Judgment — which is just another way of saying “having an opinion” — is an essential part of forming a strong position. But in the moment of listening, judgment will usually work against you. That’s because judgment constrains the processing of new information. It casts all the data you consume in light of the position you already have (the common pitfall of confirmation bias). In many ways, judgment is yet another distraction we need to eliminate. True listening means holding off on those opinions — even small, innocuous ones — and consciously choosing instead to understand. Of course, that can be quite difficult, for a couple reasons. First, our minds are extremely adept at forming opinions, often without our realizing it. While we listen, our brains are constantly integrating data, figuring out if it confirms or contradicts what we already “know” to be true, and spinning it into a strong position. To avoid judging what someone says, we have to commit to accepting that raw information as just information — not as fodder for an opinion, but as data to be understood. We have to meet someone where they are, understand why they’re feeling the way they do, analyze their meaning, without projecting our own onto it. That’s the only way to short-circuit the brain’s impulse to quickly form a judgment. Second, our society runs on the impulse to judge. Most of the conversations we engage in are oriented around having and defending an opinion, rather than understanding different points of view. The human impulse is to have a stance on a topic before we really listen, and that impulse gets amplified in society at large — on cable news programs, on social media, and in public conflicts. We have to check that socially-reinforced impulse in order to truly listen. Non-judgment is like fuel on the fire of listening. It’s a way of clearing away another major distraction — thoughts that calcify into opinion — so we can fully focus on the other person. It opens up an even greater capacity to receive information, and to invite the other person to share more without fear of judgment or recrimination. That stance creates a safe environment, builds trust and rapport, and enhances insight and understanding. Does this mean we shouldn’t have any opinions when we listen? Are we saying we shouldn’t form judgments based on what we learn? Absolutely not. It just means that we should refrain from judgment in the moment that we’re listening. Down the line — maybe right after the conversation, maybe months later — we can arrive at a position on the topic. But in the middle of a conversation, we usually don’t need to have that opinion. It will only get in the way. We are always free to form a judgment later, but we can’t go back and un-judge the content we should only have been listening to in the moment. Of course, there will always be opinions operating in the background of your listening. For example, the belief that listening is important in the first place — even that is an opinion. So is the idea that people deserve our full attention and that we can learn from other people’s experiences. But these are opinions that promote the act of listening, rather than constraining it. So we’ll never be completely without judgment. We just have to make sure that our judgments in the moment are higher-level — opinions about the importance of listening, rather than about what’s being said. The best kind of listening is an exchange. One person contributes information, the other person engages with and adds to that information, and both parties create something larger than each person could have done on their own. This is the process of “active listening,” which basically means listening with conscious involvement. Is primarily about understanding the other person rather than taking control of the conversation. It sounds like you’re excited and nervous, and maybe a little uncertain about how the trip is going to go. Is that accurate? What about the uncertainty makes you anxious? Do you think you’re angry because you’re disappointed you didn’t get the job, or because you wish you had prepared differently? I’ve actually been through something like this, and I can tell you about it quickly if you’d like. Then maybe we can see if it helps with your situation in some way. I’m getting the sense that being a nice boss is important to you. Tell me more about that. You’re asking a few really interesting questions. Which ones are the most important to you? What could I do right now to be the most helpful? It sounds like your company’s changing a lot as it grows. So what’s more important to you: having a team that makes the right choices on its own, or being involved in every single decision? That story reminds me of something you told me when we first met — about how you were afraid of losing your old friendships while you take on new opportunities. Is this part of the same issue, or is this a new challenge? I honestly don’t have the answer right now. But I can feel that this is a really tough call for you, and I’d be more than happy to talk it out. Maybe we can explore your options and see which one makes the most sense. What do you think? As you can see, these questions come in all different forms, and they apply to different issues. But they all have a few things in common: a focus on the other person, active involvement from the listener, full-body listening, an interest in expanding the conversation, appreciation for emotions, and a commitment to empathy, curiosity, and generosity. These are the elements that make a question good. Do we need to ask questions to be good listeners? Not always. Silent listening can also be effective, and sometimes it’s the most appropriate kind of listening to engage in. When someone is involved in a long and meaningful story, in the middle of venting, or just in need of an audience to explore a train of thought, silent listening can actually be the best form of attention. Sometimes we just need to be heard. At a certain point, though, the best kind of listening will usually lead to a conversation. And questions are the window into meaningful conversation. They’re the conduit to better ideas, the engine of easy conversation, and the signal that the conversation matters. It’s no surprise that many executives, leaders, and artists believe that their greatest skill is the ability to form the right questions. That question might be “What do our customers really want?”, “What does it take to make a relationship last?”, or “What does it mean to be happy?” The answers to those open-ended questions is material worth listening to — material that ends up becoming part of a solution. Which brings us to our last, and most important, principle. Expand on the other person. 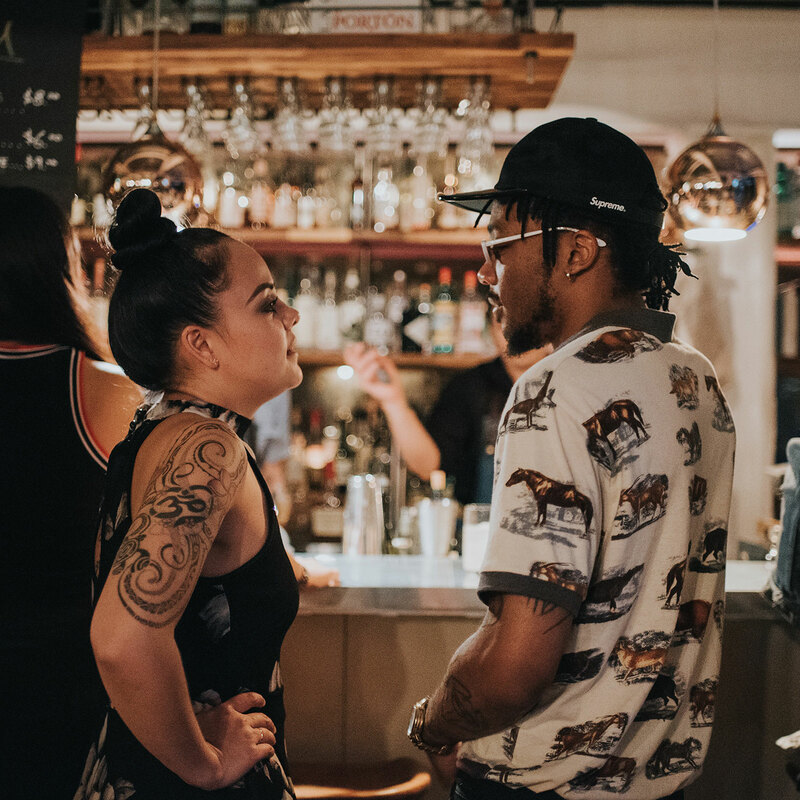 While we usually think about listening as a process of receiving someone else’s words, the best listening actually turns both parties into active participants. That means not just accepting the information being shared, but building on that information to create new and better insights. When you ask questions, you frame a problem or point to a solution that invites the other person to arrive at more specific, more useful, more productive thoughts. As we covered earlier, questions that pin an issue down, synthesize different ideas, or capture the essence of a decision help build on the limited information the other party has. When you mirror someone else’s experience, you reflect back to them what they might not be able to see themselves. This doesn’t just mean repeating what the other person says or confirming their existing beliefs, but helping them see themselves as you see them, which can give them a more accurate self-understanding. Discussing the emotions you’re observing in the other person (“You sound a little disillusioned. Is that part of what makes this hard?”), confirming the validity of their experience (“I understand why you’re feeling like this. You’re facing a lot of rejection right now, and I know that’s tough”), or sharing similar experiences of your own (“I can totally see where you’re coming from. When I was laid off…”) are all powerful ways to build on their ideas by mirroring their experience in your own way. When you address someone’s needs in a conversation, you’re building on the ideas they present to arrive at a very specific form of attention: an answer. This can take any number of forms: providing emotional support, contributing expertise, making an introduction, exploring a problem together, sharing personal experience, offering advice, or making recommendations. This seems obvious — why else would we be listening if not to help? — but many listeners don’t consciously choose to create value in this way. Asking questions and mirroring experiences are valuable in and of themselves, but they become most valuable when they’re applied to the larger goal of helping the other person arrive at a meaningful solution. When you build on the other person, you go beyond the passive mode of listening most people engage in. You become less of a receptacle and more of a vehicle; you shift from being a sounding board to being a light reflector. This volley of ideas back and forth builds to something greater than basic listening. True listening is generative. It doesn’t just take in, it creates something new. That ability — to listen in a way that generates new insights, solutions, and possibilities — is the ultimate benefit of listening. And it plays out in multiple areas of our lives. When you put these skills and principles into practice, something extraordinary happens. You add a layer of awareness to every conversation you have. You bring a new generosity to every exchange. Good listening starts off as a technique, but the more you make it a habit, the more it becomes a mindset — and the faster it becomes a lens on every interaction across your life. That superpower creates a number of powerful benefits. Listening saves time and energy. Conscious listening seems to require a massive investment. It takes time, it takes effort, and it requires undivided attention that could be spent elsewhere. In reality, though, listening is actually more efficient. Going deeper into a single interaction always delivers more meaningful results than spreading yourself across several of them — even if your brain insists that it’s actually being more productive. Consider, for a moment, all the scenarios that suffer from subpar listening. Think about the meetings where cross-talk, distraction, side chatter, and texting occur alongside the main conversation. Imagine how much faster those meetings would go if everyone agreed to truly listen for a shorter amount of time, and gave all of their attention in pursuit of the best ideas and outcomes. Many researchers believe — correctly, I’m convinced — that meetings would definitely go faster if participants really took the time to listen. But how many companies institutionalize pure attention? Think about the family conflicts where TVs, phones, concerns about work and inner monologues get in the way of actually understanding one another. How much better would we get along with our loved ones if we actually took a moment to listen and empathize with one another? How much more quickly could we resolve those issues with less blaming and more questions? And think about the way you listen to yourself — your ideas, your feelings, and your instincts — throughout the day. Imagine how much more quickly you’d solve your problems if you weren’t distracted by your phone or seduced by another episode of television. Imagine how much less energy it would require to manage your work, relationships, and responsibilities if you really placed your attention on your wants and needs. Just as we can consciously listen to other people, we can also consciously listen to ourselves. Many people believe that listening is an outmoded and inefficient process. In reality, it’s our modern tools that create that inefficiency, by depriving us of the best source of productivity: pure attention. Great relationship-building is based on a handful of core qualities: authenticity, vulnerability, rapport, and generosity. It also depends on a handful of core skills: proactivity, good communication, introductions, and follow-through. But the practice that makes all of these qualities and skills relevant — that actually puts them into action — is listening. If you want to build meaningful relationships in life, then you need to start paying attention. This principle plays out in every single sphere. Managers who listen create loyalty, rapport, and trust. They come to understand what their employees want, what motivates them to perform, and what incentivizes them to do their best work. Companies that institutionalize that kind of listening then create a culture based on those qualities. The effects ripple across the company and out to all of the relationships that make it up — vendors, customers, regulators, investors, and partners, all of whom thrive when leaders really listen. The exact same process is at work on a great first date, a casual meetup or a homeowners association meeting, where listening helps all parties understand what they need. In contexts where conflict runs high, listening becomes even more important. Of course, in high-pressure environments, the commitment to listen is often the first thing to fall away as everyone involved begins defending their position. The person who can hold the commitment to listening even in conflict-driven scenarios will always enjoy a massive advantage. This is the quality that distinguishes the leader who arbitrates between two sides, the student learns from conflict, and the family member who rises above petty in-fighting. In many ways, listening elevates us above the limited interests of drama, and allows us to become the glue that holds people together and moves them toward a solution, even when tensions run high. The more fractured our attention gets, the more valuable listening will become. The ability to focus, to offer someone our full attention, to build on someone else’s experience — this will be the competitive advantage that sets us apart at work and in life. That mindset is now becoming a kind of currency. Like money, which facilitates the exchange of value between people with different needs, the ability to listen is a form of value we can use to transact in different scenarios. We can walk into a job interview without knowing all the answers and listen our way to the right solutions. We can enter a family conflict that has layers of complexity and listen toward understanding. We can navigate the world through listening, using the techniques in this piece to understand, to grow and to develop our relationships. That’s why listening is such an important skill to develop. It’s fungible, it’s adaptive, and it’s limitless. And the less of it we find in the world, the more the world really needs it.